I often get emails from people getting ready to travel to Tokyo asking for advice on where to go shooting in Tokyo. Tokyo is such a fascinating city. It is bigger than you can possibly imagine. I have spend much of my time as a photographer shooting Tokyo. I know explore most parts of this city with my camera and pulled together this guide of my favorite places to shoot. I bet you could ask 10 photographers where there favorite places are to shoot and get 10 very different answers. I tend to shoot as I am going about my life so much of my photography is 'daily life' or places I have chosen to visit. I have not actually photographed many of the 'tourist' places and I probably need to do a bit more of that. You can stay up to date with my latest posts by subscribing. You'll also get 100 of my favorite images of Tokyo to use as wall paper or screen savers. Here is my Tokyo...as I live it and shoot it. One of my favorite little places is called Yakitori Ally, or Omoide Yokocho, in Shinjuku. Cramped bars and restaurants give you a view into post war Japan. It has a great atmosphere for early evening photography. You can also find walking directions from the station on the official Omoide Yokocho website. Another favorite is Harmonica Yokocho in Kichijoji. It's just a short 3 minute walk from the Keio Inokashira Line Kichijoji Station. In the 1940s it was an underground flea market but now a few alleys of unique bars, restaurants and shops. It is smoky, crowded and everyone is very friendly. You can get there from Shinjuku in about 20 minutes by train. There are many standing bars to stop for a drink and make some friends. There are lots of little alley ways to explore between drinks. One of my favorite spots for night shooting is Shinjuku's Golden Gai. 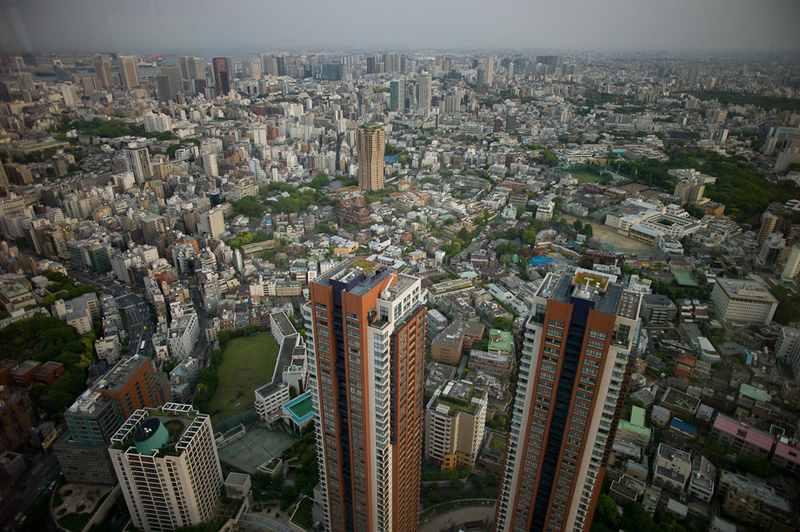 It is a small area of Shinjuku that is famous by architectural interest as well as a budding nightlife area. There are over 200 tiny shanty-style bars and restaurants within the six narrow alleys that make up Golden Gai. Golden Gai provides a view into the relatively recent past of Tokyo when much of the city was made up of narrow lanes and tiny two story buildings. You can find Golden Gai a few minutes from the East Exit of Shinjuku Station between the Shinjuku City Office and the Hanazono Shrine. Most of these bars seat only 5 to 6 people adding to their charm. There are small temples everywhere in Tokyo. I found many of them simply searching on Google Maps. They are all different and full of little charms to photograph. Then of course there is Shibuya...probably my most favorite place to photograph. Something is always going on in Shibuya. This is Hachiko...the famous loyal dog! ...and Shibuya's famous crossing. It gets so busy that up to 3,000 people cross at a single light change. Check out this time lapse video to see just how busy it is. If you go to the Marc City Hotel... you can take the guest elevator to the 25th floor and get a great view of the crossing from above. 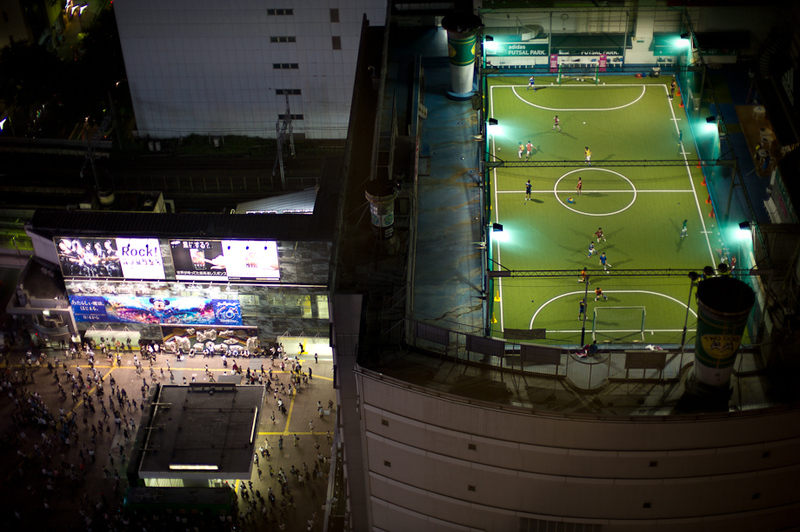 ...and some roof top soccer! If you have kids you need to take a quick trip over to Hamamatsucho and check out the Pokemon Shop. It is quite a sight and they sell Pokemon items that are only available in that shop. I do the majority of my shooting on the train. The green ring on this map is the Yamanote Line. It takes one full hour to make the complete circle. You can get off at just about any stop and find interesting things to photograph or simply ride the train and catch the action going on in the train and at the station. The stations are massive and often packed which can lead to all sorts of photographic opportunities. Get up early and catch the Tokyo Commute at Shibuya Station at 8:30-8:45Am... it will be a rush of people like you have never experienced before. ...the girl over my shoulder was amused. 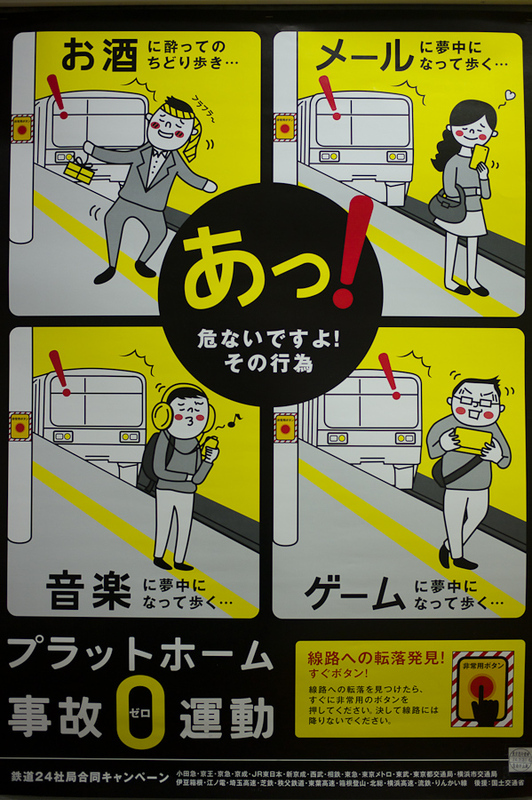 Also pay attention to the different signage around Japan... it can make for some great photography as well. May 3rd is Constitution Day in Japan. Japan’s current constitution implemented after World War II in 1947 was drawn up to replace Japan’s militaristic and absolute monarchy and replace it with democracy. It turned the Emperor of Japan into “the symbol of the State and of the unity of the people” and exercises a purely ceremonial role. It also formally rejects Japan’s right to wage war which is why it is commonly referred to as the Peace Constitution. Not everyone in Japan agrees with the new constitution and some people would prefer that the Emperor is ‘returned to power’. 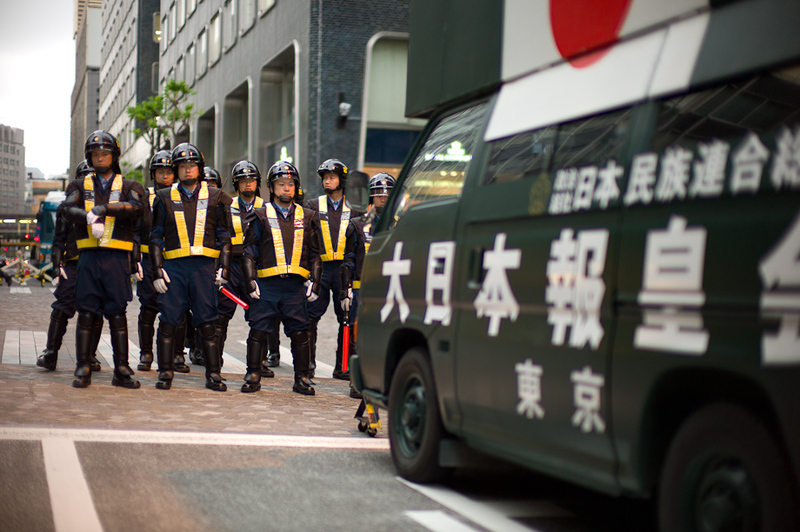 If you look around you will find the Tokyo Riot Police squaring off with those protesting against the new constitution. When shooting cities always try to get up high. Many office buildings you can take the elevator to the top and shoot out the window to get a great view of the city... here are a couple of examples. 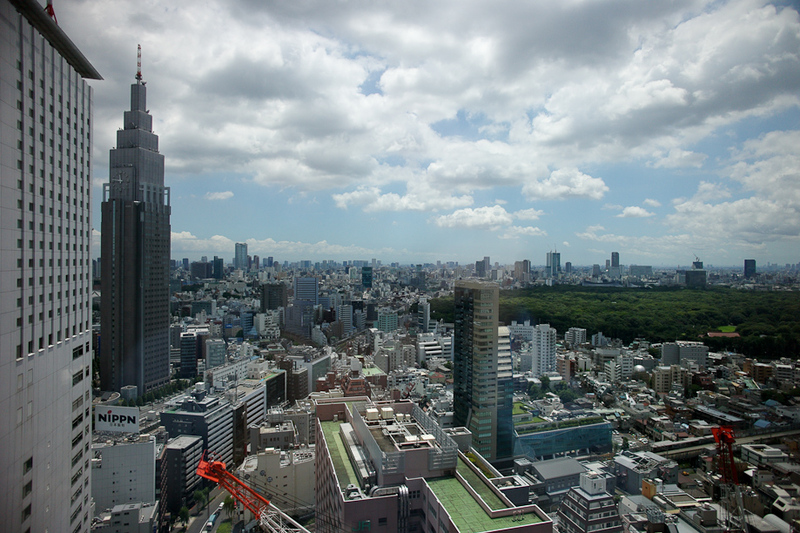 Roppongi Hills Sky View offers you the chance to shoot from the roof for 1,800 yen. The view is breathtaking and you can get some amazing pictures. Unfortunately tripods are not allowed. I love cars and Tokyo has some pretty amazing car dealerships. It is pretty easy to get in and shoot some of the most expensive cars in the world... Like at the Audi Forum Tokyo. Japan has an endless number of camera stores but here are my favorites....starting with Leica Ginza. You can spend hours lusting some of the world's best and most expensive cameras. 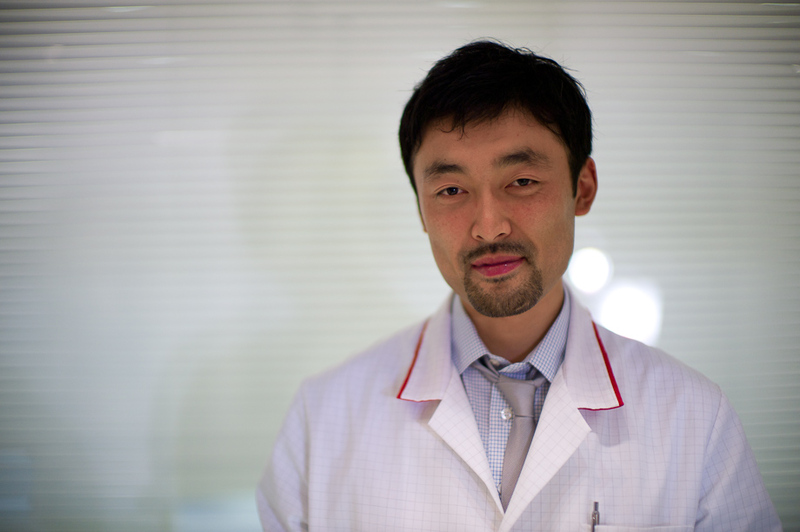 If you have a habit of breaking your gear like I do...Naoki can fix it for you! This guy is a Rock Star in my book! Just down the street and across Ginza crossing is the famous Lemon Camera. It is packed with a huge selection of used cameras and well worth the stop. In Shinjuku there is MAP camera carrying a selection of new and used cameras... The basement is Leica but they have floors for Canon, Nikon, Pentax and others. It's a cool shop. The flagship store of Yodobashi Camera is also in Shinjuku. It is hard to describe how big this place is... I think it is 8 or 1o buildings now. Just massive. Anything you want, they probably have. Another great little shop is Lucky Camera just on the other side of Shinjuku Station from Yodobashi. It is packed with lots of old Leica equipment. I got a lucky find at Lucky Camera when I first started shooting Leica. I wanted to find the original plastic 35mm viewfinder. I called a few shops in Hong Kong who told me I would never find it and if I did it would cost me more than $1,000 USD...then I got lucky at Lucky. There are also Camera Shows all the time, like this one in Shibuya. Make sure you check local magazines before you come. There are thousands or more camera shops but these are the ones that I like to go to. Another favorite of mine is Heaven in Roppongi. It is Japanese Tappanyaki. Great food for about 15,000 yen per person. Another treat is Gompachi in Nishi Azabu. It is great Japanese fare for about 10,000 per person. It is very reasonably priced and the food is excellent. This is the restaurant that they replicated for the big fight scene in Kill Bill. Sushi comes in all grades and in all price ranges...from 1,000 yen to 10,000 yen. Many places have 'sets' and you can try a bit of everything...they are usually very reasonably priced at lunch. But make sure to try 'Negitoromaki' before you leave Japan...absolutely the best. 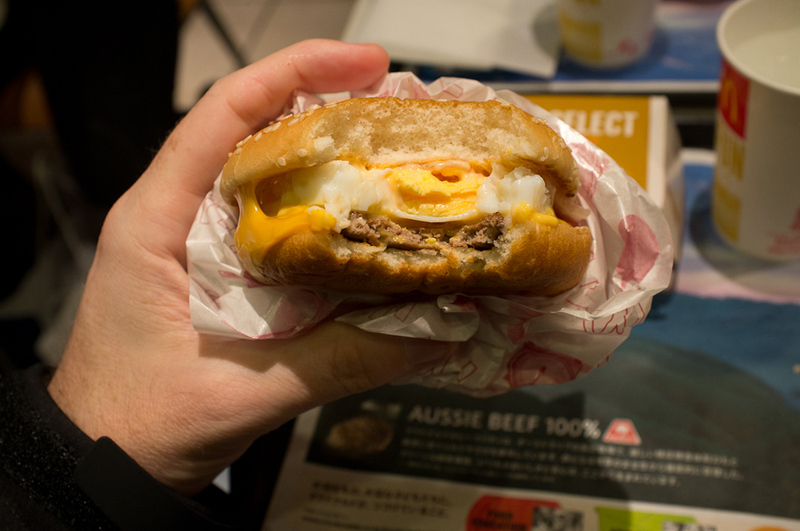 I give McDonald's a lot of flack here sometimes but one thing you must try if you are here in September/October is the annual Tsukimi Burger...it is so good. So are a lot of their monthly promotional specials. I hope you enjoyed. I will continue to update this guide so make sure to check back before your trip. Leave a comment and let me know what you found in Tokyo or if there are places you think I should add. Thanks for stopping by.